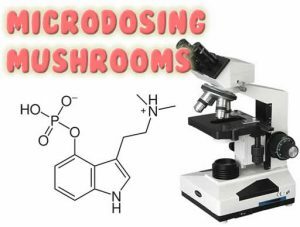 Microdosing Mushrooms is a new trend that started in the 1960’s to treat PTSD after the Vietnam war. Microdosing is when you consume micro doses that are so low they are unlikely to produce any noticeable effects. Or, produce effects that are hardly perceptible. People who microdose integrate the practice into their lifestyle to help increase creativity, focus, energy, and improve relationships skills. Others have good results using microdosing to treat anxiety and depression. Some people use the practice to open their senses and spiritual awareness. Psychedelic substances have not been legal for many years. Up until recently there were few studies of the effects of psilocybin. There is no specific research about microdosing, but there is a lot of knowledge about how large amounts of psychedelics affect the brain. LSD and psilocybin are similar in structure to the chemical serotonin in our brains. This affects everything we do from our moods and feelings, and how we understand the world we live in. Hence, LSD and psilocybin work in a similar way to serotonin. Antidepressants boost serotonin levels to make you feel better. Psychedelics actually mimic serotonin to stimulate growth and activity. They also increase the levels of glutamate in your system. Glutamate is a neurotransmitter that affects your memory, how you learn and your cognitive ability. Using psychedelics allows the different parts of your brain that do not usually communicate with each other to communicate. Psilocybin works by inhibiting the overworked part of the brain called the ‘default mode network’ (DMN). The DMN is the part of the brain used for things such as thinking of your past and planning for the future, self-reflection, and daydreaming. Some think there is a link between depression and an overactive DMN. When this part of the brain is in overdrive it causes you to overthink every aspect of your life. To always question and analyse every part of your past and the future. Microdosing with LSD and magic shrooms can help to combat anxiety and depression. It can give you a greater creative insight and perspective you may not otherwise have the chance to experience. When you microdose with shrooms, you take tiny doses that will not be enough to alter the way you see the world around you very much. The intention is not to cause wild mood swings or a change in how you think. The dose should be so low so it only causes a subtle effect. It is simple to prepare magic mushies for microdosing. How much you need will depend on whether you use dried or fresh shrooms. And the variety and part of the plant used will all have different levels of psilocybin. It is recommended to start out with shroom powder and to measure out just 0.1 g as the first dose. You can always adjust the levels as you learn how it affects you. This is a good place to start and learn about the effects of shroom microdosing. The Psychedelic Explorer’s Guide author, Dr James Fadiman recommends microdosing every three days over two or three weeks. Take a dose on day 1 and then on day 4. Leave three clear days between each dose. Fadiman says people should record the experience in a journal daily. Write down everything you feel, how the shrooms affect you, your energy levels, and your social activity. Do not change your daily life while microdosing. Rather integrate the practice into your lifestyle. The first time you try microdosing you may want to take the day off work to observe how it affects you. Make sure you keep observing its affects every day, including the days between microdoses. People report they feel a greater creative flow and more energy. Do not microdose with the psilocybin from magic mushies every day. Taking too much over the long term can cause heart problems. While it is not known if this is relevant to microdosing, it is best to keep this in mind. You can also build up a tolerance to psilocybin and it may have less effects taking the same amount over time. This is why Fadiman recommends leaving three days between each microdose. Something to avoid is normalising microdosing shrooms like you do with a coffee to boost your productivity. As we all know, one cup of coffee turns into two and then three to produce the same effects over a few months. Use microdosing sparingly rather than turning it into a consistent habit like drinking coffee. There are two main reasons people microdose with shrooms. To decrease undesirable states of mind and to increase desirable states of mind. Undesirable states of mind can include the effects of PTSD, mood disorders, depression, addictions, anxiety, and ADD/ADHD. Research has shown microdosing to be successful for treating depression, addiction and anxiety. Anecdotal evidence also shows people using microdosing to treat mental illness also had positive effects. Desirable states of mind can include increasing empathy and improving relationships, productivity and focus, energy levels, creativity, athletic coordination, flow states, and leadership development. Microdosing allows you to enter into a cohesive flow state to explore new ideas and states of consciousness. People use microdosing to help them find solutions for work challenges, reduce procrastination, and to boost creative thinking as well as to help improve social interpersonal skills. The riskiest thing about microdosing is the law. It is not exactly legal, but you need to check the laws in your area for possessing magic shrooms. Microdosing is a safe introduction into the world of psychedelics. Magic shrooms are a natural substance and have a good safety record, as long as you know what you are taking. Because you are taking it in such tiny amounts, you can measure the way it affects you while exploring the possibilities that psychedelics open up to you. While the risks are low, microdosing mushrooms with psilocybin can amplify your current mood. You should talk to a doctor before microdosing if you have schizophrenia, psychosis, or severe anxiety. Microdosing with too much psilocybin can lead to manic episodes. These are some of the things you need to know before you trying out microdosing for yourself. This article in no way condones the taking of illicit drugs. We recommend that you check out the laws surrounding LSD and magic shrooms where you live before trying out microdosing to see how it affects you. I recently got some mushies to give it a try. Supposedly the effects are along the line of reduced anxiety, increased creativity/confidence and better cognitive function/ thought process’s.